“Strange Cares”: Brings “Emilee`s Race” to the Super Bowl! 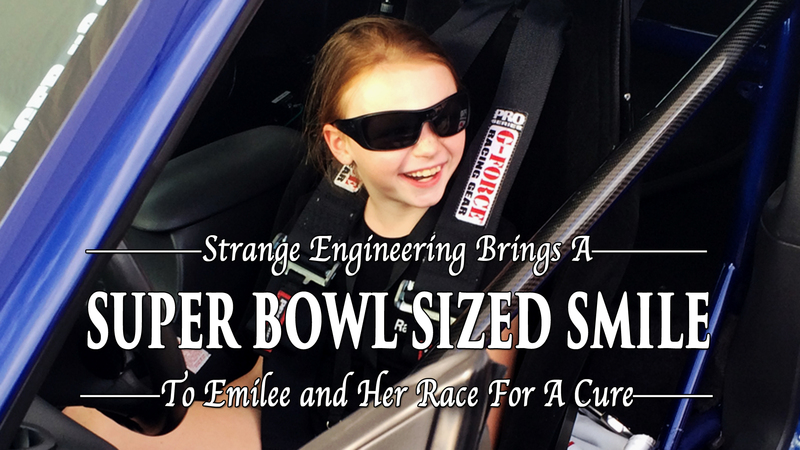 Home/Strange Racing/“Strange Cares”: Brings “Emilee`s Race” to the Super Bowl! 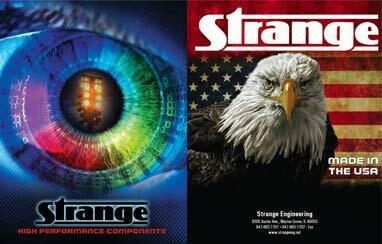 Strange Engineering has been developing for some time now our “Strange Cares” Program. “Strange Cares” will be dedicated to people that have been stricken with life-threatening illness. To provide financial support for medical debt, to create awareness for the individuals` illness to facilitate involvement in a cure. To ensure people never feel alone, to bring a smile to the family anyway we can everyday. While still in the development phase for this program, we came across little Emilee Hurt. And for lack of a better term: we cared too much to let her bright smile slip through our fingers! Emilee Hurt is a 9 year old little ball of courage! Diagnosed at age 5 with Type 1 Diabetes, Emilee has been a fighter for her entire life. Type 1 diabetes occurs when the body’s immune system attacks and destroys certain cells in the pancreas, an organ about the size of a hand that is located behind the lower part of the stomach. These cells — called beta cells — are contained, along with other types of cells, within small islands of endocrine cells called the pancreatic islets. Beta cells normally produce insulin, a hormone that helps the body move the glucose contained in food into cells throughout the body, which use it for energy. But when the beta cells are destroyed, no insulin can be produced, and the glucose stays in the blood instead, where it can cause serious damage to all the organ systems of the body.For this reason, people with type 1 diabetes must take insulin in order to stay alive. This means undergoing multiple injections daily, or having insulin delivered through an insulin pump, and testing their blood sugar by pricking their fingers for blood six or more times a day. People with diabetes must also carefully balance their food intake and their exercise to regulate their blood sugar levels, in an attempt to avoid hypoglycemic (low blood sugar) and hyperglycemic (high blood sugar) reactions, which can be life threatening. With these challenges to a 5 year old little girl, we can not imagine the toll that it takes on her spirit and her family day-to-day. But one thing is for sure, Emilee is NOT your average gal! Emilee is courageous and brave, excitable and pro-active! Emilee is our little hero! She chose to keep her head high and fight against her diabetes with a smile! If you talk to Emilee, she is not simply knowledgable; but she tracks her sugar and carbs herself, she can program and attach her Omnipod herself, and she is the first one to begin telling you all about her disease and how to control and fight against it! 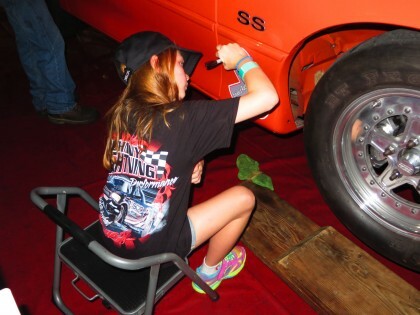 She is a role model, not only for her adorable little sister Hailee, but for her entire family ~ and after this years NMRA NMCA Super Bowl race, she is now a hero and role model to hundreds of racers and crew members alike! After speaking to Emilee`s mother Brenda, and learning about “Emilee`s Race for a Cure”, we could not pass up the opportunity to do something really special for her. 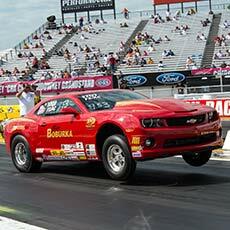 Emilee loves drag racing, and her all time favorites are the MUSTANGS! (She can pick them out before you even notice them in the distance!) 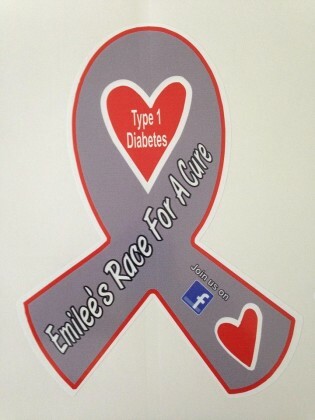 Emilee`s parents started a Facebook page ( Emilee`s Race For A Cure ) to spread awareness for her cause, and their wishes for raising money for healthcare and awareness with the JDRF (Juvenile Diabetes Research Foundation). 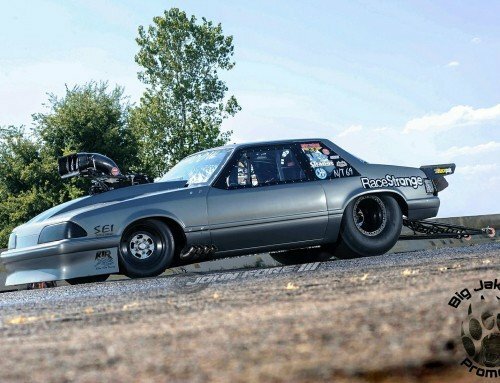 Swain, Emilees` father, is in the process of converting his 89` Mustang “FOXROD” to an all out Drag Car, with future plans to bracket race in Emilee`s honor and raise awareness and funds for the JDRF. In the very beginning of their endeavor, Emilee had already designed her very own decal with “Emilee`s Race For A Cure” on the awareness ribbon! It did not take us very long to decide exactly what we wanted to do for the Hurt family! The Hurts were able to make it to Joliet a day early, allowing them 3 FULL DAYS of racing action! Upon arrival, the amazing event directors at the NMRA/NMCA were able to get them a prime parking spot for their truck, trailer and mustang directly behind the Strange bus, right at the cusp of the Midway! They could not have come at a better time of day, showing up only mere minutes from when we were going to give out the decals to our Strange Engineering Coyote Stock class, for which Strange Engineering had previously purchased 20 of Emilees` decals for our racers to sport during the event. After parking and getting situated, we headed over to the staging lanes, two little squealing excited girls in tow, to meet the racers! 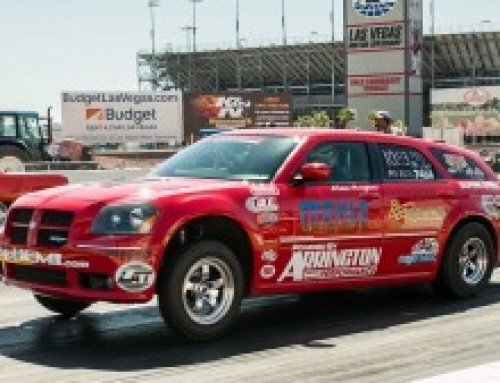 The Strange Engineering Sponsored Coyote Stock racers were lined up in the staging lanes as we made our way over. And never have I been more proud to associate myself with such a fine group of men! They put the term “inviting” to shame, welcoming Emilee and her family in with open arms! Each racer hugging Emilee and bringing her over to their car; even letting Emilee personally pick out where SHE wanted her decal to go! (And as we all know…that is quite a generous offer!) Each racer shared laughs and high fives, thumbs-up pictures and huge smiles ~ it was simply heart-warming to watch! Emilee and her family were on cloud nine as they met and talked with the Coyote Stockers, watching them take Emilee in, Drew Lyons even putting Emilee in the drivers seat! It was the very first stop that we made, and I was already taken aback by the overwhelming kindness that our men had shown! They made all of us at Strange Engineering proud! But that was merely the tip of the iceberg for Emilee and her family on their “Strange Cares” adventure! After meeting the racers and putting on the decals, Emilee was ready to run to the lanes and watch them race with “her sticker”! But thanks to the wonderful directors of the NMRA NMCA Superbowl, Emilee and her family got to watch the races from the suites! You might think that a 9 year old would not so much take advantage of this fantastic view…but you would be mistaken! 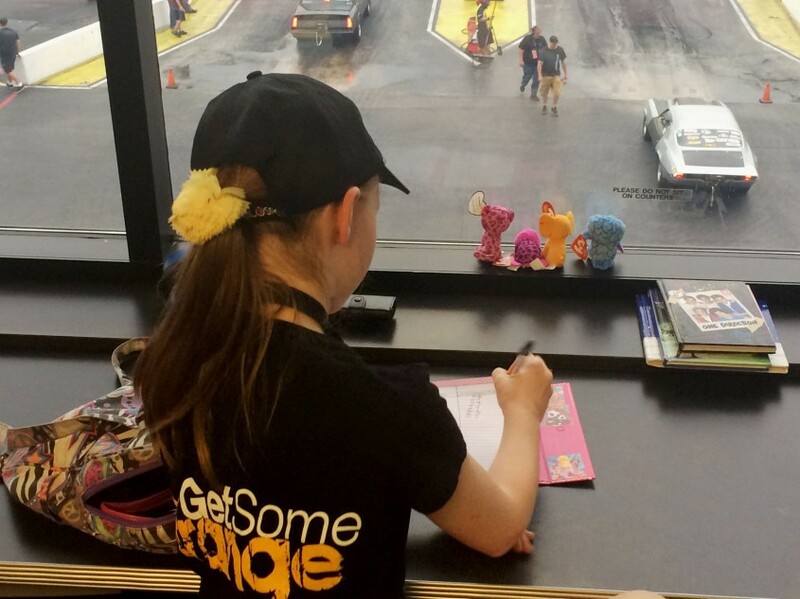 Emilee immediately set up her very own workspace right up against the glass, even setting up her beanie babies to watch the race while she took notes; and yes, you read that right ~ Emilee took notes on all the racers! It was right about this time that things really started to pick up. After cheering on the Coyote Stockers, I took the family down to meet the announcers in the tower. And I want to personally extend a thank you to them, because they went above and beyond with Emilee. They introduced themselves to her , and told Emilees` story over the PA system for all to hear! Even coming up with the idea to auction off a “signature decal” from Emilee to the highest bidder! They were an immense push to get the word out and help people to know how to find us and meet Emilee! After hearing the Emilee`s story, the love and support came flowing in! 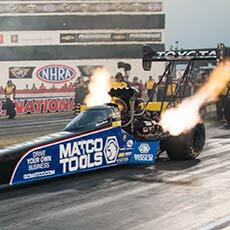 Mickey Thompson Tires jumped in and upped the bid, offering a set of racing slicks to the highest bidder over $100 on the signed decal! HUGE thank you to them! And once the bidding began, it continued to climb higher and higher! Amazingly, the signed decal sold for a whopping $600 to SAM Racing School of Automotive Mechanics! The Hurt family were in tears of joy and disbelief! They were amazed at the love and compassion of people who did not even know them, to come together and be so generous and supportive of Emilee! They even had Emilee over the next night for photos of the signing of the check and presented the check to Emilee herself! She was beaming when she got to sign the actual decal on the car! The pouring in of support for Emilee continued throughout the weekend. Scott Lovell, one of the Renegade class racers, met us in the suites and spent the next few passes meeting the family and talking with them. Scott shared with the family that his wife was also a Type 1 Diabetic, and explained how much her story designated with him. 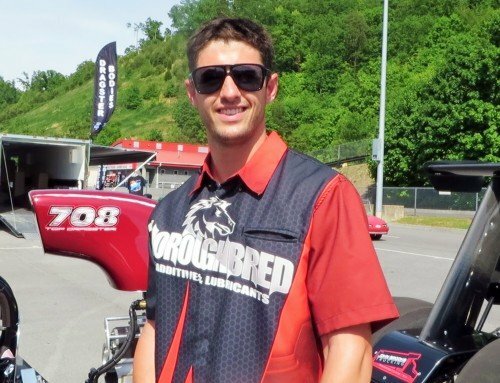 Scott then went above and beyond, purchasing 21 decals from the family, yet only taking 11 for the Renegades, leaving the rest of the profit to the family. 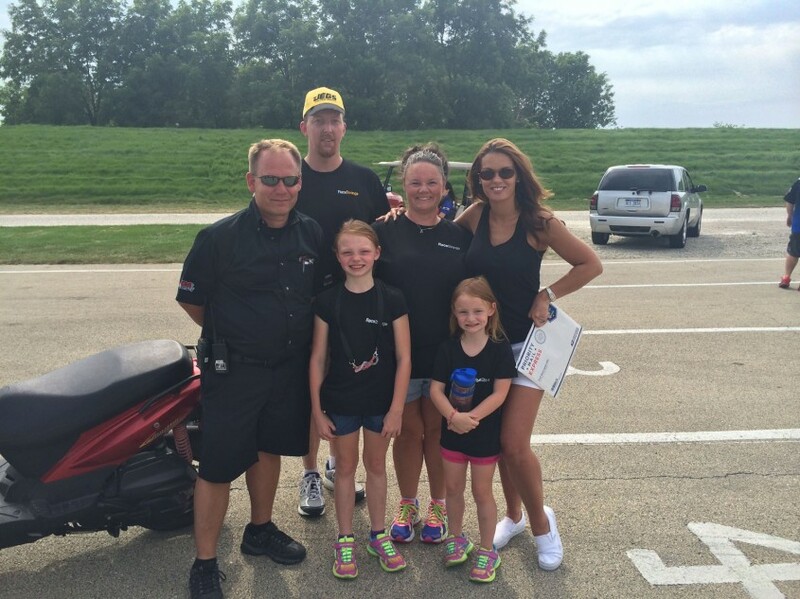 Before the next pass, we were back in the staging lanes, where Scott went with us, introducing Emilee to all of the Renegade racers, who were just as eager to meet Emilee and have her put her decals on their cars! The patience and love they showed her, half suited up and in the last leg of the staging lanes, they all still took each lasting second to talk to Emilee and take part in making her weekend one for the books! For that, we at Strange Engineering would like to extend a special thank you to the Renegades, and especially Scott, for your generosity extended so much further than you could imagine! At any point had the weekend been cut short, I am sure that it still would have been the best weekend of Emilees` life! But the fun had only just begun! Over the course of the weekend, more and more racers reached out to Emilee and her family, each seemingly giving her more and more of a sparkle! She played it cool in front of the racers, but don’t let her fool you guys; she was practically SQUEALING with excitement at each and every opportunity! Joe Charles, one of our Strange Engineering Sponsored Coyote Stock drivers, along with his crew member Jason Sloan, took a special segment out of their day to show Emilee the ropes! Joe invited Emilee to see his race car, put her in the drivers seat, and even let her put on his helmet! 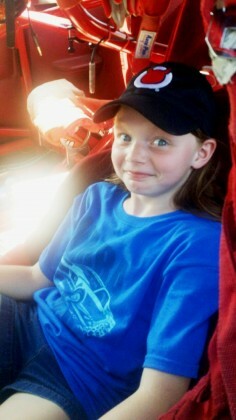 And Jason gifted both Emilee and her little sister Hailee with matching team hats! 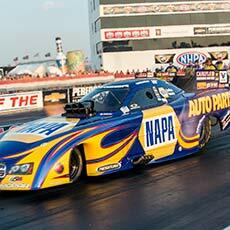 Her smile chased away any cloud that dared come across Route 66 Raceway that day! 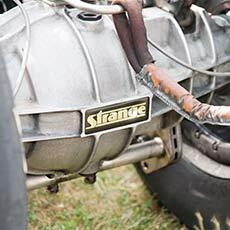 A special thank you goes out to Joe and Jason for being such outstanding Strange Racers! We at Strange engineering cannot express the joy that we were able to take from bringing little Emilee and her family out to the Super Bowl event. The sheer joy on the girls` faces and the outpour of gratitude (and tears of joy!) were more than we could have hoped for. Knowing that our sport and the racers and staff members who take part in it have such heart and compassion, makes every day seem more like a dream for me than work. The fact that not only did the Strange Engineering Sponsored class racers, but also other classes jumped in to support Emilee speaks columns to the character of the men and women of our sport. They even went so far as to have Emilee be the shining star of all of the winners circle photos! She even got to wear the prized ring! The experience for the Hurt family was one that I doubt they will ever forget. 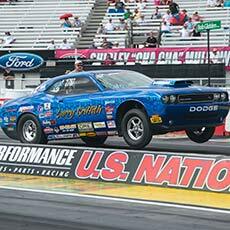 They were able to get their story out and feel the immediate embrace of the drag racing community around them. 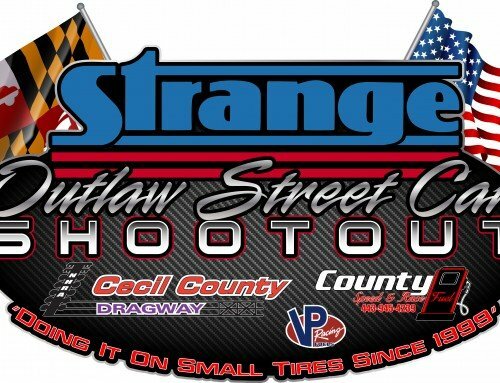 They were able to raise over $1,600 for Emilee and her cause; were able to pick up a sponsor for their continued dreams to bracket race, and made new friends and family within our community! 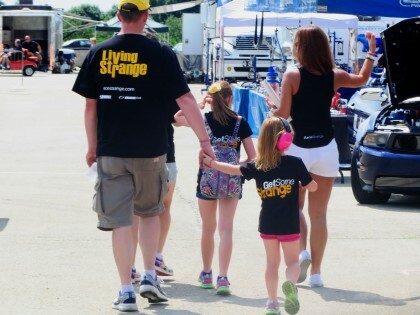 With the help of our racers and the event directors and announcers, Strange Engineering was able to give this family the weekend of a lifetime, and we thank everyone who went above and beyond to make it special! Charlie Booze may have taken the cake for getting the reaction of a lifetime out of Emilee however; by putting her in his drivers seat and then starting the race car with Emilee inside! Below is a short clip of Emilee experiencing it! It is things like this that make our sport unique. The willingness of these men and women to come together and lift up this little girl. The ability of our racers and staff to open their hearts and truly be touched by the spirit of this little warrior! 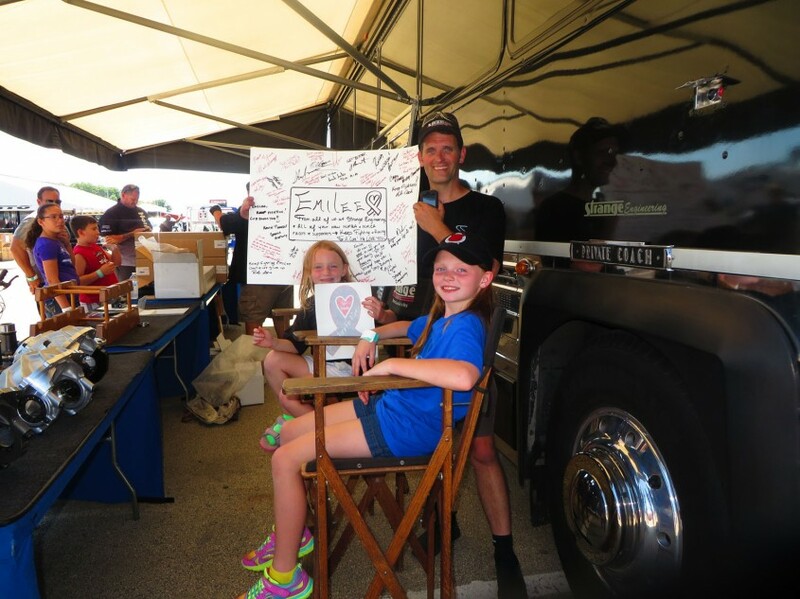 She certainly filled our hearts at Strange Engineering with her beaming smile and her bravery, and we witnessed Emilee and her family make a huge and lasting impact on our racers at Route 66 Raceway this past weekend! For some of our racers, her decal will race throughout the lifetime of the car, much less the season! 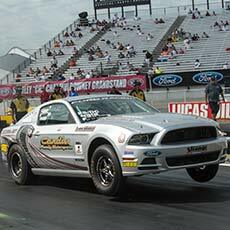 That is certainly the case for Racer Corey Stephens, who had Emilee sign her name to his carbon fiber wing! What an honor Emilee thought that was! A short clip of the signing is below. 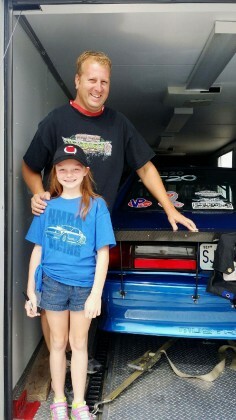 Emilee says she will never forget her weekend with the family of the NMCA/NMRA and Strange Engineering! As a parting gift, we made her a poster FILLED with the signatures of all of the racers and crew! Now she can show all of her friends just how many NEW friends she made over the summer! I have a feeling that beaming smile will be running up the school steps this year! To each and every individual who took the time to lift this little girl and her family up, and have their own spirits lifted by seeing her smile, we at Strange Engineering say “Thank You”! We hope to hear more about this little trailblazer, and we wish for more wins in the future for “Emilee`s Race For A Cure! We at Strange Engineering will be cheering you on the whole way! We hope you enjoy the FULL album below of ALL of our racers and crew members interacting with Emilee and the Hurt Family! 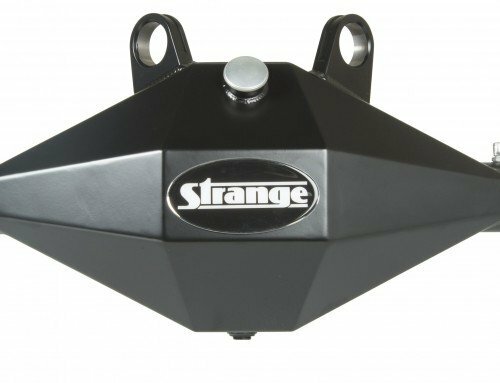 We said that we would be changing the game up for our 50th Anniversary and I think this may just turn out to be a HUGE highlight on our season at Strange Engineering! We hope that Emilee and the Hurt family continue successfully “Racing For A Cure”…And Remember, Don’t Just Race….Race Strange!